Anthony wins best beard at Warrior Dash! 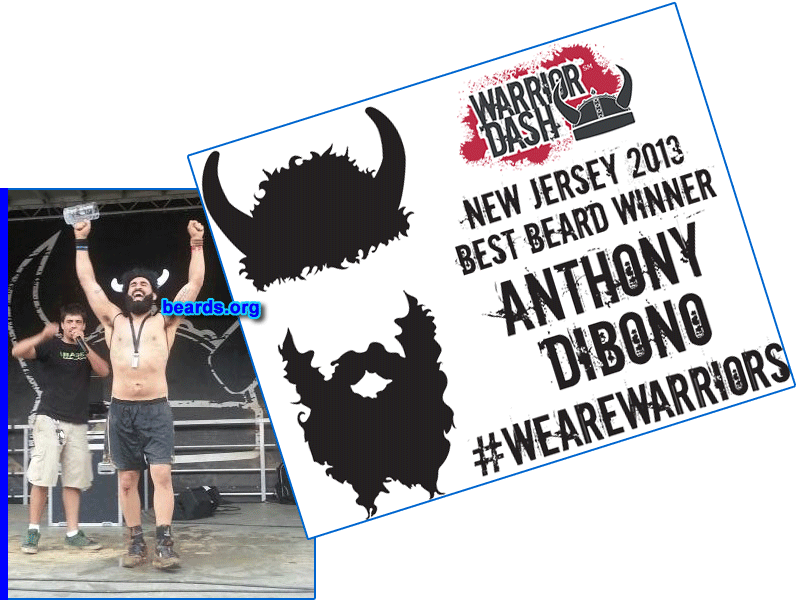 Anthony won best beard at Warrior Dash in New Jersey in 2013! He tells about it below. Ever since college ended and I started working full-time, I gradually became out of shape. I gained forty pounds over the two-year period. By the time I noticed, it was too late. There was a biggest loser competition at work. So I decided to join in order to get back in shape and become healthy once again. I started exercising and working out more frequently and started to eat healthy by re-designing my diet. After four months I am proud to say that I lost fifty pounds and feel amazing. This motivated me to enter the Warrior Dash competition in New Jersey, which is a three-mile obstacle course. At the end of the race, there was a beard competition for all who competed that day. Of course I was obligated to enter. of the beard competition starting in five minutes. I immediately became zoned in and focused, preparing for the battle ahead of me. head-to-head and the crowd would pick the winner. There were seven bearded competitors all seeking the same prize: a bearded victory after a grueling obstacle course competition. The first round I received a “bye” because I was the seventh competitor, which allowed me to enter the second round unscathed. The second round I went up against a guy in a kilt, wielding a chicken leg and a mug of beer. I was nervous and intimidated because I was not sure if I were able to compete against this fierce competitor. My friend in the crowd quickly ran over to me and handed me a full mug of beer. At this very moment I knew exactly what I needed to do to win the crowd over. When my name was called, I walked to the front of the stage, chugged the whole mug of beer, dripping it all over my beard and screamed out to the crowd. The crowd screamed back with allegiance and it gave me the edge I needed to defeat my opponent. This allowed me to move to the final round, battling a man with a massive, styled mustache. When the announcer called my name again I screamed out to the crowd once again, stroked my beard, and flexed my “beard muscles”. When the announcer called out my name as the winner, I was overwhelmed with joy and could not control my feelings. This was my first bearded victory and I could not believe it. I had been growing my beard for only a year and I already won a beard contest. This is how I know I will be destined for beard greatness. 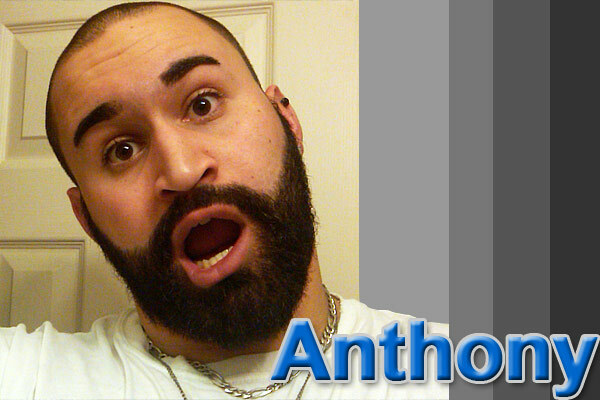 Also: Anthony’s charity fundraising beard event! Anthony held a fundraiser to fight prostate/testicular cancer at Mulcahy’s bar in Wantagh, NY on Thursday, December 19, 2013. Congratulations to Anthony, contestants, and supporters on this terrific event! Be sure to see the newest photos added to Anthony’s photo album. Or return to Anthony’s beard feature.